East… West… Everywhere had two blog posts about beginner fountain pens in December. 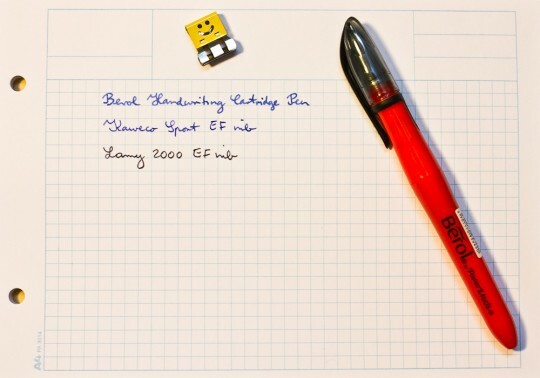 Some of the fountain pens in these blog posts are really affordable and I didn’t expect to find a cheaper fountain pen …but when I recently ordered something from CultPens I was surprised to find an even cheaper fountain pen1: The Berol Handwriting Cartridge Pen (New Look version). Berol, a British company that is now a subsidiary of Newell Rubbermaid, has its origins in pencil making. In 1856 Daniel Berolzheimer went from Franconia, where Staedtler and Faber-Castell are from, to the USA and founded the Eagle Pencil Company. I don’t want to bore you with details, but in the end Newell Rubbermaid took over. 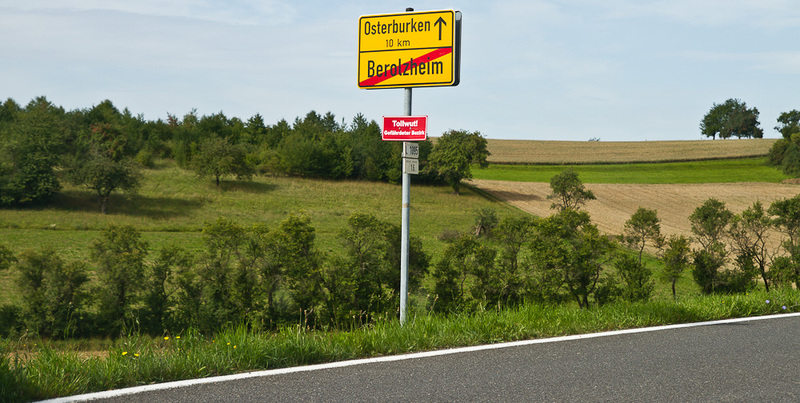 Many readers of pencil blogs will also know that the Berolzheimer family is still part of today’s pencil industry as they own CalCedar. Some will also remember how they managed to upset parts of the pencil community last year, but there is no direct link to Berol or Newell Rubbermaid. I paid £2.45 (~ $4; €3). There is only one nib width available. The pen is made in China. I don’t really find it very good looking, but better looking fountain pens, like the Pelikan Pelikano junior (< £10) or the Kaweco Sport (< £20) are several times more expensive than the Berol Handwriting Cartridge Pen. The Berol comes with a rubber ring and a rubberised grip area to make holding the pen more comfortable. It is very light, some might find it too light, but fairly comfortable to hold. The nib is not very wet, not very dry either. It’s certainly drier than most Pelikan nibs, but they tend to be on the wet side anyway. Ink will dry fast and you won’t see a lot of shading. With it writing fairly dry ink cartridges should last a long time, but light inks might appear too light on the paper. I didn’t have a problem with nib not ‘starting’, even after the pen hasn’t been used for several weeks. Unfortunately I only had the pen on my desk, so I am not sure whether ink will spill if the pen is knocked around in a pencil case. 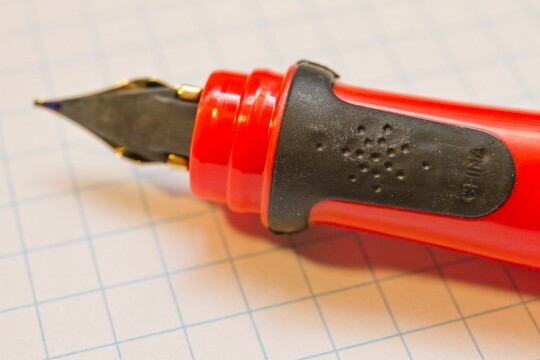 The nib is very rigid, which is normal for cheap pens. If you try to vary the line width this is not the pen for you. This pen offers excellent value for money. For me it’s not really a beauty, but that’s subjective – you might like the looks. 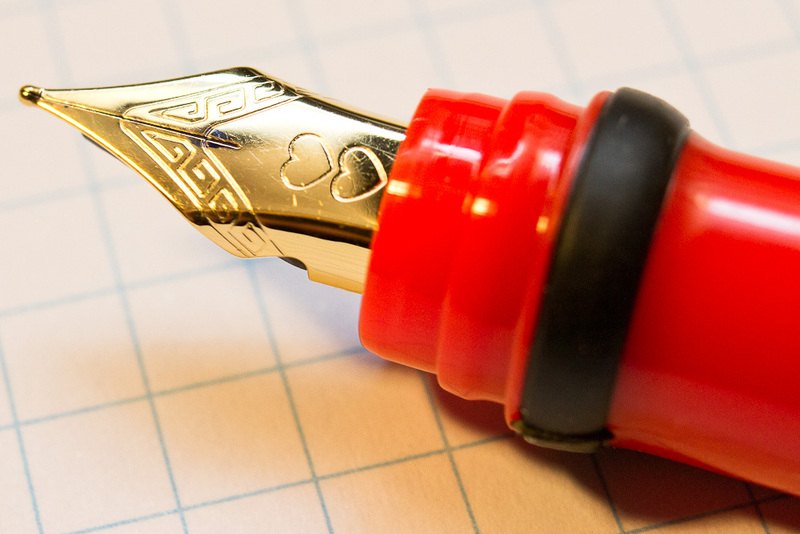 If you want a cheap fountain pen that does the job this pen might just be right for you. The paper in the pictures is from the RAH STMT X Iceland kit.